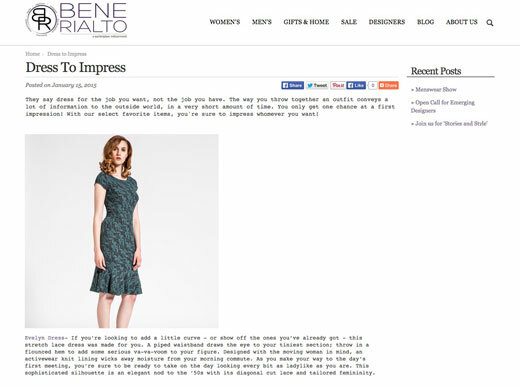 We woke up to a wonderful surprise the other day—a fantastic write-up in Women's Wear Daily on Bene Rialto including a shot of our Bubble Dress. 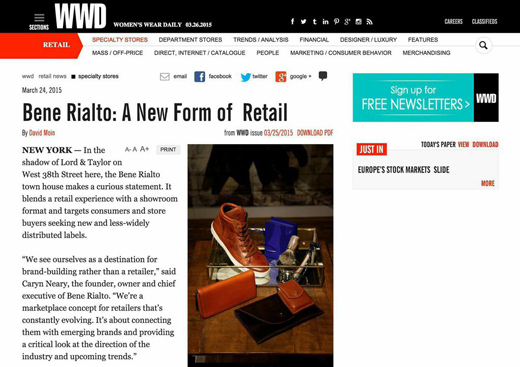 If you haven't heard, Bene Rialto is a multi-level marketplace changing the way we physically shop by blending a "retail experience with a showroom format," to borrow a few words from David Moin's WWD write-up. And not only can you shop, there are also special events held amid the floors of designers goods and on the top floor, which was designed to be a meeting place of sorts complete with artwork and ambiance. It shouldn't come as a surprise to anyone that kicking off a sustainable company is no easy task. But luckily there are organizations like Factory45 out there helping eco-friendly brands take their business to the next level. Factory45 founder Shannon Whitehead really does know best—she got her own fashion brand off the ground on Kickstarter in 2010, with a project that was the highest funded fashion project at the time. Factory45 not only helps up-and-coming brands source fabric, find a manufacturer, and raise money to fund production, but they also make sure to highlight the people behind the growing brands. Their most recent profile: Our very own Nicole Lenzen. 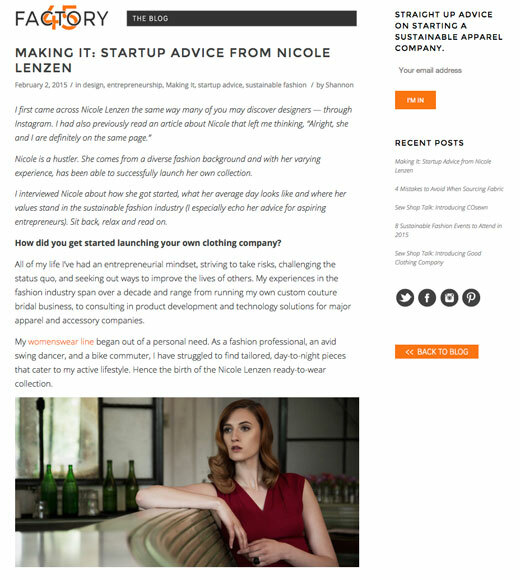 Shannon took some time to talk Nicole's designing process and involvement in her clothing, a day in the life, and advice for entrepreneurs. Click through for the entire Q&A with Nicole, or check it out on Factory45—you don't want to miss this one! Making a first impression is crucial, whether you're on a date, job interview, or meeting with a client. The best thing you can do to start things off on the right note? Pick out a flattering outfit. When you feel your best, you're bound to put off that confident glow. 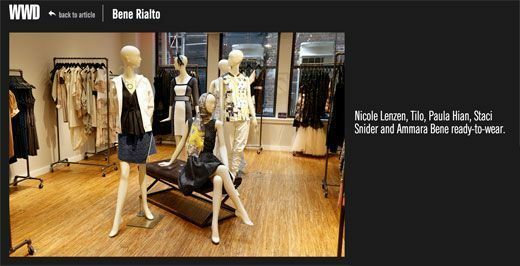 The good people over at Bene Rialto have pulled five "Dress to Impress" store picks together—you'll recognize a few familiar Nicole Lenzen faces! Our Bubble Dress, Evelyn Dress, and Elena Dress are made to stand out. We've had a great time being a part of the Young & Able Series space in Lower Manhattan—from our styling event on December 9th to the packed opening party. You've still got a few days to visit the space before it closes up on December 21st. (You're sure to find something for everyone on your holiday list!) The wonderful Rose Mayo from Blonde in This City got all gussied up in some of the pieces from the Young & Able shop—including our very own Erin Dress. Head on over to her blog to read the full write-up and see what she loved about her Nicole Lenzen dress. From the beginning, the Young & Able mission has been to bring up-and-coming designers of all persuasions—jewelry, clothing, home accessories—together in one space. From their debut Kickstarter campaign to their most recent month-long pop-up shop in Lower Manhattan (check it out before December 21st! ), the Young & Able initiative is going strong, and the designers behind the name are all creating beautiful work. The Style Line—a tumblr-turned-blog started back in 2011 by Rachel Schwartzmann aimed at "Bringing Storytelling with style back to the web"—shared the stories behind beautiful work shown on and at Young & Able. Rachel spent some time with the designers and chatted with Nicole on our movement-friendly clothing, what being young and able means to Nicole, and more. 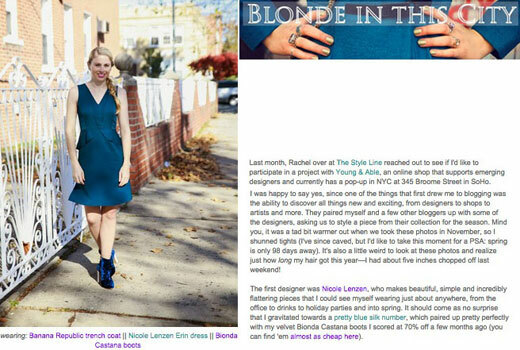 Click through to read our spotlight, along with a look into the other 25 Young & Able designers. We were thrilled to have NYC stylist Sara Jessica Berman (who previously interviewed Nicole on her blog and Lucky Magazine) recently visit our studio. We were able to show her some #BehindTheSeams insight into our prototyping process, which she covered in her In The Studio post. She also tried on some dresses from the collection and looked absolutely stunning! 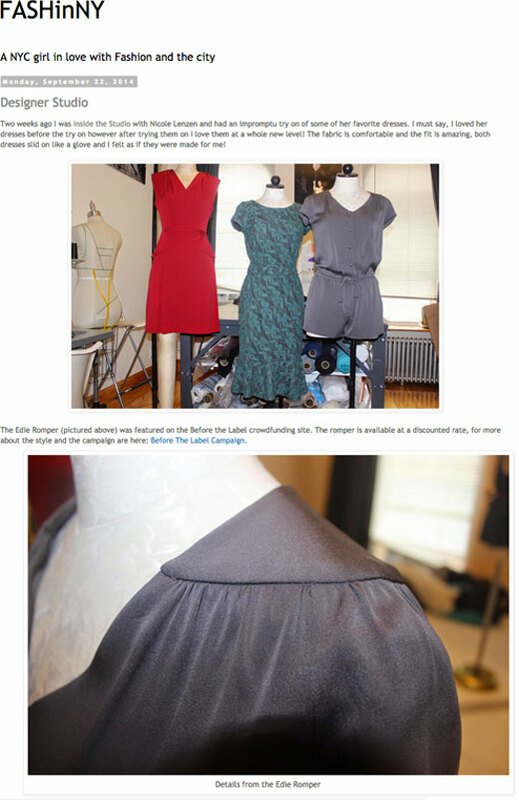 She noted in a followup post on the collection "I must say, I loved her dresses before the try-on; however now I love them at a whole new level! The fabric is comfortable and the fit is amazing, both dresses slid on like a glove and I felt as if they were made for me!" Reach out to Sara for styling services via her blog or through her profile on Keaton Row. 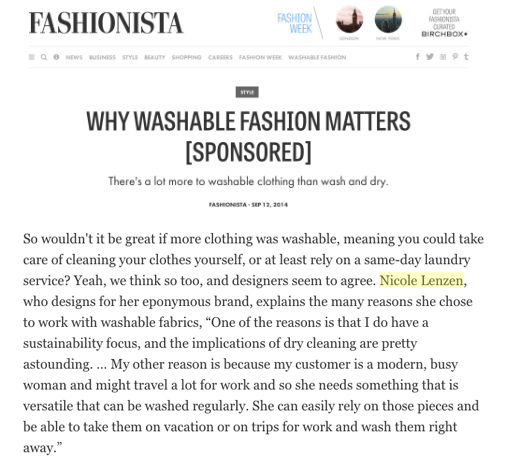 We're excited to share Fashionista.com's coverage on the recent NYFW #WashableFashion show. We were one of the designers that walked the runway at the event on September 20th, and the interviewee in this recap. Click through for the full story. June 6, 2014 - No Comments! 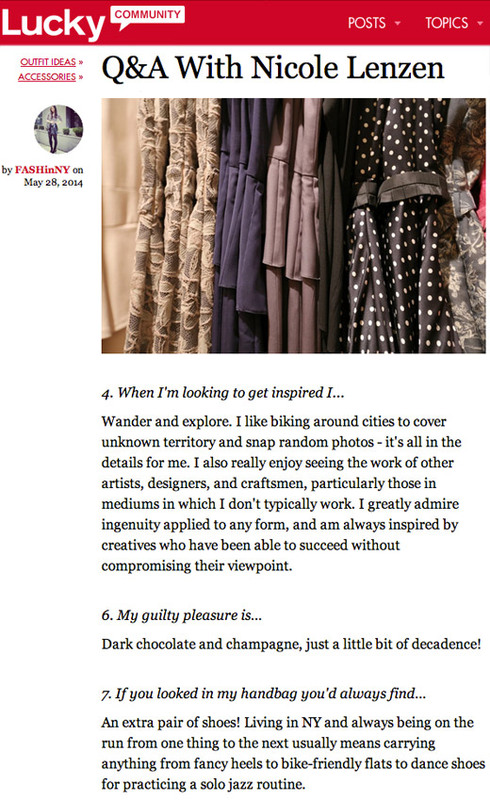 Excited to have NYC Stylist Sara Berman's Q&A with Nicole Lenzen featured on Lucky Magazine as well as Sara's FASHinNY blog. Sara and her fabulous styling can be found on Keaton Row. February 10, 2014 - No Comments! We are excited to share this Q&A with Nicole Lenzen in Goodlifer Magazine! Click through for the full article. February 2, 2014 - No Comments! 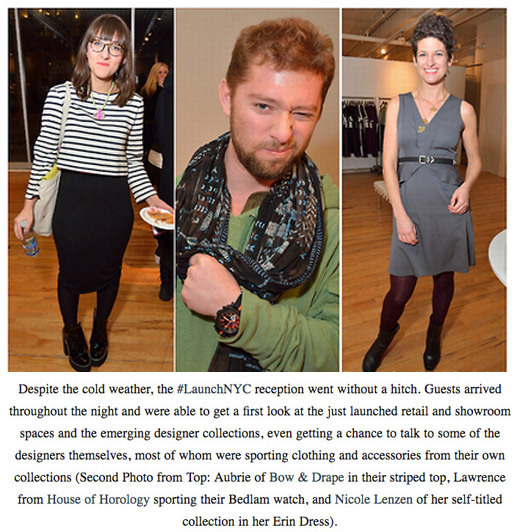 Great write-up by Lionesque Group on the Launch NYC Fashion Week reception!